Ask an Orthodox Christian what the difference is between Orthodoxy and other Christian Churches and you will probably hear as many answers as people you approach. While it is true that our Faith differs in many ways from Western Christian systems of belief (worship, spirituality, doctrine, etc.) there is one major difference that sets us apart from all the rest. Actually, this unique characteristic of Orthodoxy was present (and perhaps still is to some degree) in all of Christendom. However, in our modern, humanistic, and relativist society, it has been all but forgotten by most of the so-called followers of our Lord Jesus Christ. This characteristic is the quality of servitude/obedience. 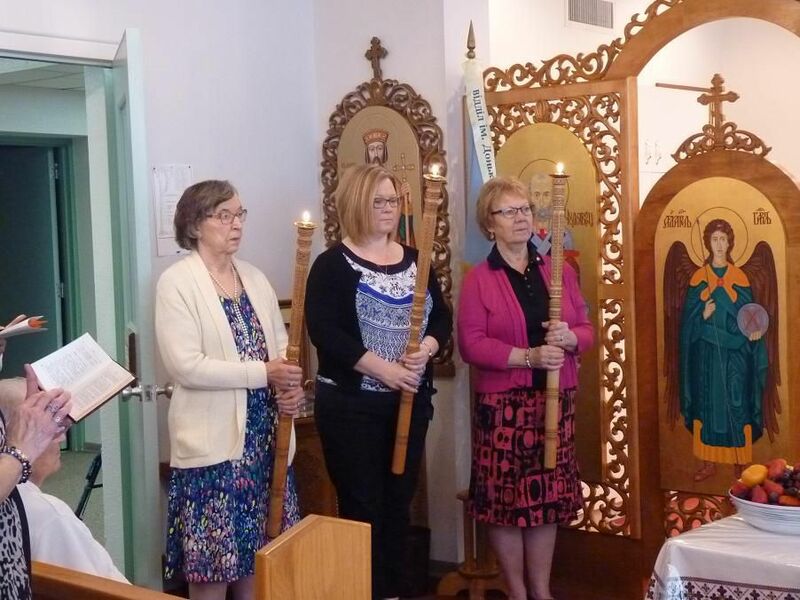 In every divine service we attend, we are called to follow the example of the Holy Theotokos and Ever-Virgin Mary and all the Saints, in committing “ourselves, one another and our whole life to Christ our God”. The key phrase in this proclamation (or rather instruction) is “our whole life”. The Holy Scriptures and Tradition of our Church has a unique and uncompromising challenge for us — a complete dedication to our God, Jesus Christ. This call to devotion flies in the face of the Western concept of individual freedom. In our society we are taught that all people must decide for themselves what is right or wrong, productive or unproductive, functional or dysfunctional. Most of the Western Christian Churches have gladly hopped on the “relativist” band wagon. The acceptance of practicing homosexuals into ministerial positions; the solemnizing of gay and lesbian marriages; the belief that marriage is simply an option for those who wish, while cohabitation is acceptable as well, and the complete lack of direction (or even concern) in matters of spiritual growth and doctrinal truth are all symptoms of mainstream Christianity’s embrace of secular relativism. “Do your own thing,'” the call of the societal fringe in the 1960’s and 70’s has become the basic precept for life in the western world in the 80’s and 90’s. There is hope, though. In this sea a ship, an ark, cruises. This ark is the One True Church of Jesus Christ, driven by the wind that is the Holy Spirit of God, and kept on course by the Rudder that is the Holy Tradition of the Faith. This Ship searches out those ho are floundering, ready to throw them a line and lift them us to where it is dry, safe and warm. The key, though, is that we must be willing to get into the Ark. Too many times, afraid of committing our “whole life to Christ our God”, we choose instead to just hang on to the line and be dragged along in the water. Again, eventually, we ask, “How much longer can I hang on?” Tragically, some of us even choose to let go, instead of making the climb to the deck. We are afraid to make the climb because it means rising up out of the water; it means turning away from the delusions, fads and fancies that society calls “civilized” living. Particularly, it means giving up on the notion that I know what is best for me, what is right for me, and therefore I can “do my own thing”. Taught from childhood that we are the primary locus of determination in our lives, the idea of giving up, even to the Will of the Omnipotent and Omniscient God, is foreign and even frightening. Nevertheless, this offering up of the self is the primary move in becoming a true disciple Christ. In fact, it is the pivotal event that offers us a chance at finding true meaning and purpose in our existence. This is not to say that we no longer think for ourselves; rather, in all our plans, hopes and situations, we add the phrase “God willing” — “God willing, we will buy a new house;” “God willing, I will finish University next year;” “God willing, we will be married next month.” If something is God’s will, the Christian has complete assurance that it will happen; if something is not God’s will, he/she knows that it is for the best that it did not happen, and asks the Lord for guidance in making the next step in life. The Holy Mothers and Fathers of the Church speak of the great spiritual and emotional serenity that comes with this conviction. No longer does one lose sleep over the outcome of an endeavor; one simply does the best job one can, and leaves the success or failure of the work in the Lord’s hands, knowing that either way, the result is part of God’s providential care for the world. This conviction, that in all things we must rely completely, implicitly on God’s Providential care, is not a new idea to Christianity. But, for the most part it was forgotten long ago in the West. The mistrust in God’s Will and activity in the world lead Western Christian scholars to come up with quasi-scientific theories on how bread and wine can (or in some cases cannot) become the Very Body and Blood of Christ. It lead some Christian factions to give up infant baptism — the greatest gift parents can give a child, next to its very existence itself. In recent years it has turned Christian ministry and ordination into a political issue, a lever of power, instead of looking at it as the life-calling to one of a myriad of forms of ministry in the Church. In most of Christendom the politics of power, personal and societal, has taken the place of the call to selfless love and service of God and neighbor. Our Holy Orthodox Church, however, has never let go of this all-important Christian precept. To be a Christian is to be a disciple (an imitator of Christ). In all things Jesus taught that He did not seek or carry out His own will, but the will of the Heavenly Father (see the Gospel of St. John 5). We too must seek not our own will, regardless of how good our intentions are, but the Will of God for us. This is the great point of divergence between Eastern and Western Christianity, and a great challenge of all Orthodox women and men. To “commit our whole life to Christ our God” is not an easy endeavor, but then, our Lord never said following Him would be easy. Without this complete dedication to God, we cling on to drift wood in an endless sea of corruption and fallacy. Difficult though it may be, our total devotion to Christ is the one Truth pathway to authentic meaning and peace in life.